The alchemy practised by Plato has recently become a subject of great interest since the Royal Wedding, when they rolled back the carpet in front of the high altar at Westminster Abbey to reveal the Cosmati pavement bearing the ancient Greek natural philosopher’s splendid alchemical vision of the creation of the universe. This has brought an esoteric subject which was shrouded in the mists of time right up the present day, when the needs of monarchs appears to be no different to their predecessors thousands of years ago. This is to rely on magical lore, described through alchemical models, for their legitimacy ~ in other words, for their right to rule. On Plato’s design, the four elements were said to rotate, changing from one to another as they impressed their forms on the impressionable but unchanging prima materia or First Matter. Plato’s concept of an animate universe and world was also crucial to the concept of the Land of Britain as a living organism whose wellbeing depended upon the health of its king. In the middle of this intricate pattern of endless circles were the circular motifs of the prima materia, a disc of Egyptian onyx marble veined like the Earth, a disc of gold, the most highly evolved of material substances on which all kings would be crowned to symbolise their part in a divine enactment of the celestial order. The Cosmati pavement was a great source of inspiration to medieval alchemists, including Roger Bacon who wrote an alchemical treaty on the Secreta Secretorum, which was supposed to be the teachings given by Aristotle to Alexander the Great on the mysteries of nature, astrology, physiognomy and the Philosopher’s Stone, the magical talisman stone which is said to transform everything it touches. But going back to at least St Dunstan, abbot of Glastonbury Abbey in the 10th century, the role of the alchemist has always been to support the monarch in one way or another. St Dunstan was also an alchemist and very close to King Edmund, and perhaps it is no coincidence that the Michael leyline, which does a very potent fertility dance here with the Mary line, ends at Bury St Edmunds. Glastonbury ~ right up to the present day ~ has long been a hive of magical activity, with tunnels snaking underground where the Catholic monk alchemists would practice their craft. 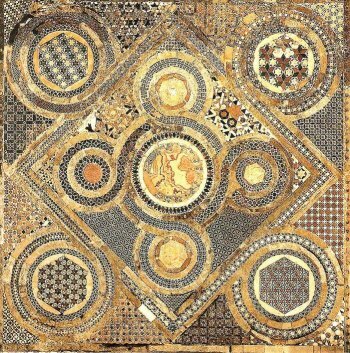 It’s clear, too, that the Christianity practised here was always much more Celtic and, therefore, Gnostic and alchemic, than the Roman variety. The Glastonbury Christians were able to declare some autonomy from Rome because of their claim that they were founded hundreds of years earlier than Augustine’s mission to Canterbury by no less that Joseph of Arimithea, Jesus’s uncle. In the legends, Joseph of Arimethea was said to have brought with him to Glastonbury two vials containing Jesus’s blood and plasma. In other words, one vial of red blood and another of white or transparent liquid. Please note this, because it will make more sense later on. But until Henry VIII, alchemists from about the 12th century onwards were always either in the employ of kings (in order to produce the gold or the Philosopher’s Stone) or being locked up in prison by kings for failing to supply said gold or Philosopher’s Stone. However, Henry’s daughter, Elizabeth I, brought back the practice with her court becoming a haven for alchemists such as John Dee who, hundreds of years after Dunstan’s death, raided Dunstan’s tomb in Glastonbury for his alchemical recipe for the Philosopher’s Stone. Even today, the Queen has sprigs from the Holy Thorn, from the gardens of the same church Dee raided, sent to her on Christmas Day. Kathryn Middleton’s wedding bouquet also contained a sprig of the Holy Thorn. So even when, supposedly, modern science has swept away the alchemists’ paraphernalia along with his meditation room from the lab, why does the monarchy still find the need to display certain archetypal motifs to the masses to ensure their legitimacy? In order to understand the reasons for this, we will need trace back these allegorical motifs which made up the code of the ancient alchemists of Greece and Alexandria in the early centuries of the Common Era. From the Emerald Tablet, and the writings of the Greek and Alexandrian alchemists onwards, we can see that the Divine Marriage is the most important event in the Great Work of producing the Philosopher’s Stone, which is said to transform everything it touches. The Divine Marriage refers to the result of bringing together two purified polar opposite substances and through that pair, creating a third extremely powerful substance. This third substance, the Philosopher’s Stone, was also known as the Child of the Conjunction or Child of the Philosopher. In Christian alchemy, Christ was viewed as the Child of the Philosopher, or the Philosopher’s Stone. Every event in the story of the Christ as told in the New Testament, was seen by medieval alchemists as a metaphor for an operation within the Great Work. The nativity in the stable under the star represented, to them, the birth of the Philosopher’s Child or Stone, and the rest of his life was interpreted as various stages of the alchemical workings after the production of the stone: separation, conjunction, fermentation and sublimation. For me, once I understood this, I had a number of “Aha” moments when revisiting Christian symbols which had hitherto seemed meaningless to me. Apparently, medieval alchemists saw the whole of the three day period of the death and resurrection of the Christ as the three stages of the alchemical process of the Great Work. The first stage of the crucifixion represents the first black stage, when the sun disappears. Thus, this gives us the black (nigredo) phase of the Eucharist. And so where do we find the second white stage and third red stage? But one of the soldiers with a spear pierced his side, and forthwith came there out blood and water. John 19:34. In the Holy Communion ritual, white bread is consumed along with red wine “in re-memberance of me”. The re-membering (conjunction) takes place after the dismemberment stage of the separation within alchemy. Holy Communion or the Eucharist is also known in liturgical masses as ‘transubtiation’ ~ alchemists call it ‘transmutation’. There is a reference to the Divine Wedding, found in Gnostic Christian literature which was initially banned by Bishop Irenaeus in the third century. Irenaeus was the first to promote a literal version of the Jesus story and would only use literature with which he could make that case. At that time, those who believed in a historical Jesus Christ were very few and far between and those we now call Gnostics, who understood the literature to be allegorical, were in the majority. But after Bishop Irenaeus’s ruling, they had to hide their manuscripts in the deserts and deep in caves. In 1945, a cache of these banned gospels were discovered in the Nag Hammadi caves in Egypt and, alongside stories about Jesus which were plainly allegorical, were also found works of Plato. Once seen through the new perspective of the Nag Hammadi texts, Jesus’s turning of the white water into red wine at the Wedding in Cana, as recounted in the Gospel of John, takes on a different meaning. The Gnostic Christian alchemical marriage or Divine Wedding takes place in the ‘bridal chamber’ and in the Nag Hammadi text Exegesis of the Soul, the whore abandons her work in the marketplace to prepare the bridal chamber for the Christ/brother/husband. So the divine marriage is about regeneration and resurrection of a new spirit, in other words, a Spring-like renewal. The Royal Wedding was held on Beltane, a ritual time of renewal so ancient that it even predates the Celts and comes from a more stellar-oriented race. We can now see why alchemical symbolism was required to provide the magic for the Royal Wedding ritual, and thus why they rolled back the carpet. It took a while for the penny to drop … but take a look at this. It’s called the Monas Hieroglyphica, and it was created by John Dee, an astrologer/alchemist within the court of Queen Elizabeth I, and it’s said to be the most exquisite and elegant conceptual model of the Great Work ever devised. Dee believed his Monas to carry the secret of the Philosopher’s Stone, and thus the transformation of anything in the universe. It was considered to be such an important alchemical model by the Elizabethans that its frontispiece became known as the Greater Seal of London. The design of the Monas shows an egg filled with embryonic fluid which is known as the Hermetic Egg. The fluid represents prima materia or First Matter, which is the base matter of the universe. The dot at the centre represents the Sun, and also gold. The Sun and gold are interchangeable in alchemy, as are the Moon and silver which is represented by the lunar crescent on its egg ‘head’. 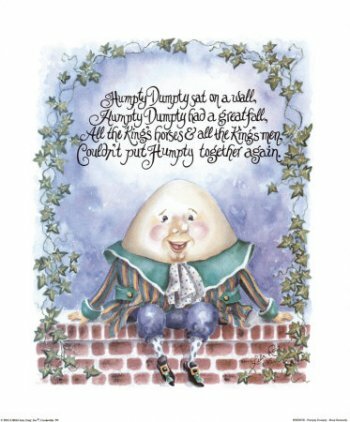 I’m reminded of the nursery rhyme, Humpty Dumpty, which surely must be an allegory for the destruction of the knowledge about alchemy under King James I, the author of Daemonologie who rewrote the Bible as well being a vociferous promoter of witch-hunts, and to whom Dee had to apply for protection when he was accused of being a wizard. 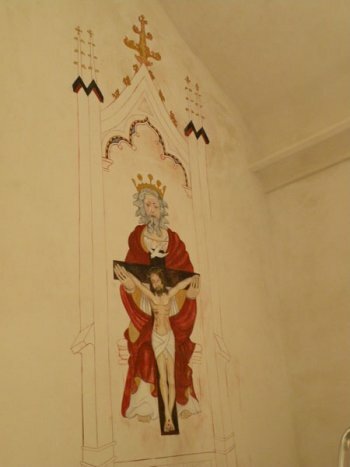 * By the way, the wall mural of the crucifixion in St Patrick’s Chapel is relatively new from when the chapel was restored a few years ago. I’m trying to find out from the artist, Fleur Kelly, from where she got her inspiration and whether or not she was restoring a similar picture that lay underneath it. Just for fun, some people think ‘first matter’ is about the future. The newsletter is well worth checking out. Well, in one respect, Cai, prima materia or first matter is about the future ~ the past, the present and the future ~ because it is the base material for all that is and all that will ever be. The only thing is, modern day scientists have reduced matter to what we think of as’form’ ~ liquid, solid or gas. But early Christians and medieval alchemists considered first matter to be also energetic and to exist on many levels, including the astral plains, the Three Worlds of the Siberian shaman and the Nine Worlds of the Norse and Indian mythology, which are all just different names and concepts for energetic levels outside this dimension that we know of. What happens on this Earthly plain is created first in what most shamans call the Underworld or the Lower World. You can change the future, therefore, by changing what happens in the Underworld by a process of alchemy performed on that level. The earliest Christian monks were alchemists who understood the alchemy of the soul, and helped in this way to purify the souls of individuals (microcosm) as well as the souls of the King and the Land (macrocosm). As above, so below. The Glastonbury Celtic Christian monks managed for a long time to retain their independence from Rome, and so were able to create Glastonbury as an alchemic healing centre for the soul, which meant it became a huge centre of pilgrimage. It still retains much of that reputation today albeit there are some black magicians now trying to interfere and grab that energy for themselves. Some of those alchemic templates are still in place today while some are in the process of being dissolved and replaced with new ones to make way for the (for want of a better word) New Age. Somewhere a few weeks ago I read a phrase that transfixed me, rang like a great underwater bell in the ocean of my awareness. Just let that run through you for awhile . . . . sister . . . . species . . . . .
And just what – you might ask – has this to do with the alchemical? Then the second bell, and the third bell joined the harmony. And of how many of these am I thus made? I don’t know. Many. All. So she came out of the darkness, shy no more. The Goddess. And he came out of the darkness, with his cloak of awe. The Horned One. Sister and Brother, yes, and Husband and Wife, yes, and Root and Branch, yes. Thank you very much for this interesting and timely piece. Royal weddings have always been of great importance to this country, one has only to think about their importance in the Arthurian mysteries. One of the key sentences there is that “The Queen and the Land are One” , which should lead us into the right direction. Interesting as well is the role Dr John Dee played in the alchemical revival during the reign of Elizabeth I. As noted in a post on my own web log William Lilly and the Cabala, Dee was involved in the Rosicrucian movement, which in turn adopted his monas glyph. This brings me back to the main point, the theme of the royal wedding. The author of the famous Rosicrucian pamphlets, Valentine Andreae, included an engraving of the monas hieroglyph in his “Chymical Wedding of Christian Rosenkreutz”. His work ties in neatly with your account, adding to the general theme and is well worth a read for the interested reader of your web log.